The easiest way to create a view is through the view designer. The rest of this page shows how to use this. 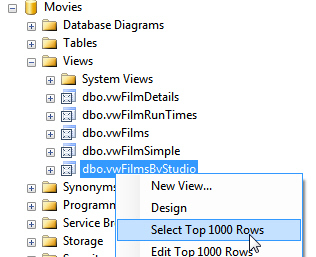 The view designer is a great way to start a query off and get your joins right, but if you want to link to tables in other databases, include complicated calculations in a view or add comments to it, you'll need to switch over to scripting your view (as described in the next part of this blog). Right-click on the Views category and choose to create a new view. You can now choose upon which tables the view should be based. Choose whether you're basing your view on tables, or on other views. Choose the tables (you can use the CTRL key to select more than one table at the same time). Click to Add the tables to your view. When you've finished, click on the Close button to remove this Add Table dialog box. Add tables to your view by following the numbered steps above. You can speed things up by double-clicking on each table that you want to include, then by pressing ESC to get rid of the dialog box. 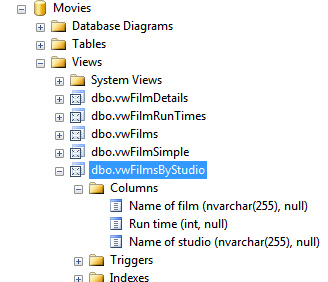 Here there is a relationship between the films and studios table in the underlying database, so this appears in the view designer. If the relationship didn't appear, you could add it in by clicking on a column in one table, and dragging it onto the corresponding column in the other table (then releasing the mouse button). 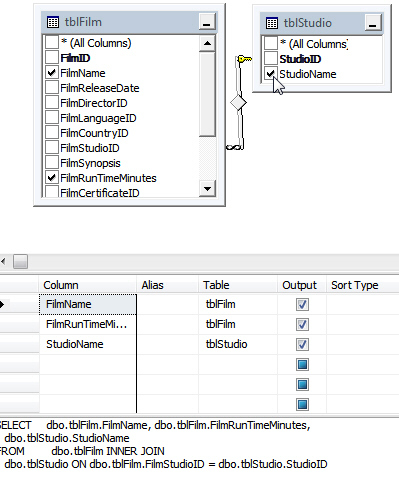 Here we've ticked 3 columns, to show the film name, the run time in minutes and the studio name. 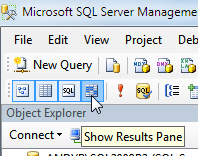 You can see that SQL Server is creating the SQL query for you at the bottom of the window. 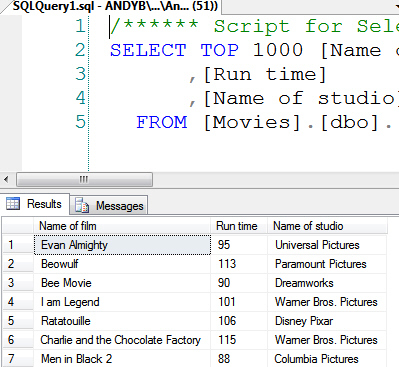 You don't have to type the square brackets - SQL will add these for you. 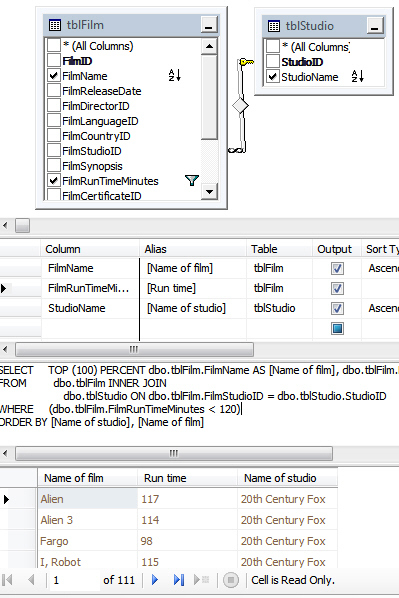 Here we're sorting by the studio name, then by the film name (the numbers 1 and 2 give the priority order for sorting). Here we're showing all films lasting less than 2 hours. Click on this red exclamation mark tool to run your view and see the results. However, it's probably a good idea to keep all parts of the view window visible. Click on this tool, or press CTRL + S.
Click on this cross to close down your view. Click Yes to confirm that you want to save your view. By convention, view names typically start with vw, to distinguish them from tables. The new view in the list of views (you can expand the view to show what columns it includes). 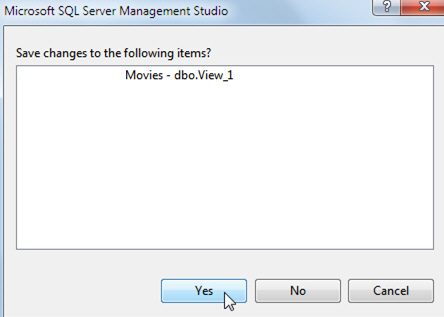 The exact menu option depends on the version of SQL Server Management Studio that you're using. The first 7 of the 111 rows returned by this view. 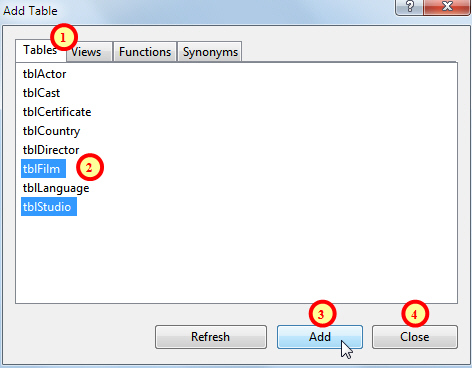 So that is how you create a view in design view - let's have a look now at the alternative: scripting a view.